RVillage is the new social network specifically for RVers. We hope to use it both for fun and for business as we travel. The best way to teach is face to face and one on one, but we don’t get much opportunity to do that in our lifestyle. With RVillage, we plan to let people know where we’re going to be ahead of time and if they’re going to be nearby we can arrange small classes or one-on-one tutoring. So, we’re practicing with RVillage. 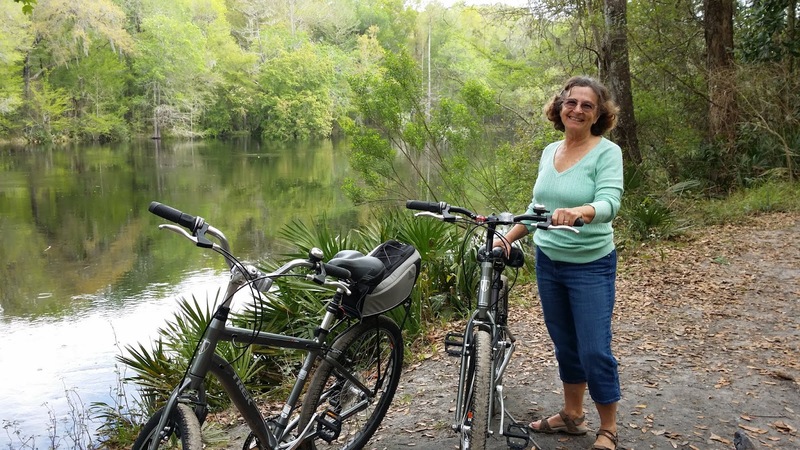 When we pulled into Thousand Trails Orlando, we used RVillage to ‘check in.’ We saw that there were 9 other RVillagers also checked in here and we scheduled a get-together and invited them all. Three people took us up on it and we had a great time getting to know each other and discussing tech stuff like Internet connections with smartphones and FoxFi as well as using Google+ for uploading and sharing your pictures. Here’s Kris and Bill – who we already knew from Seeing the USA, and Nancy who we had not met before. If you’re an RVer, we encourage you to join RVillage (it’s free) and then join the group Geeks On Tour. You’ll be able to look at a map at any time to see where we are – and all the other members of the group. 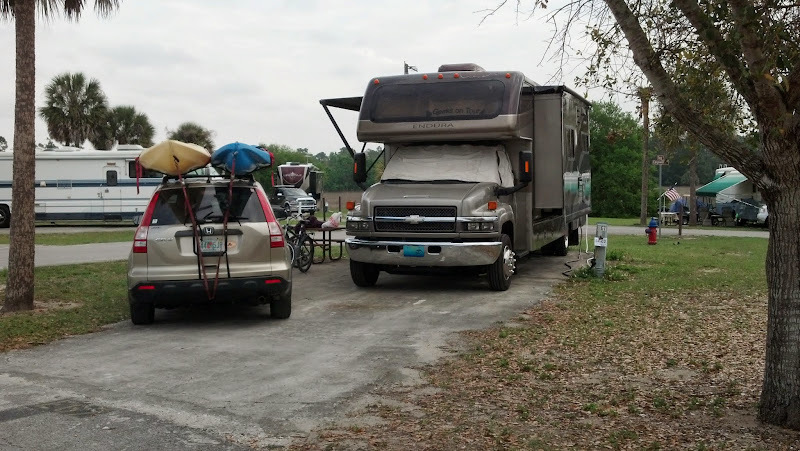 Whenever you check into an RV park, it is such an easy matter to see who else is there, then you can look at their profiles and see if you share any interests and may want to get together. You can send individual messages to people you’d like to get together with, or schedule a group get together and see who all shows up! 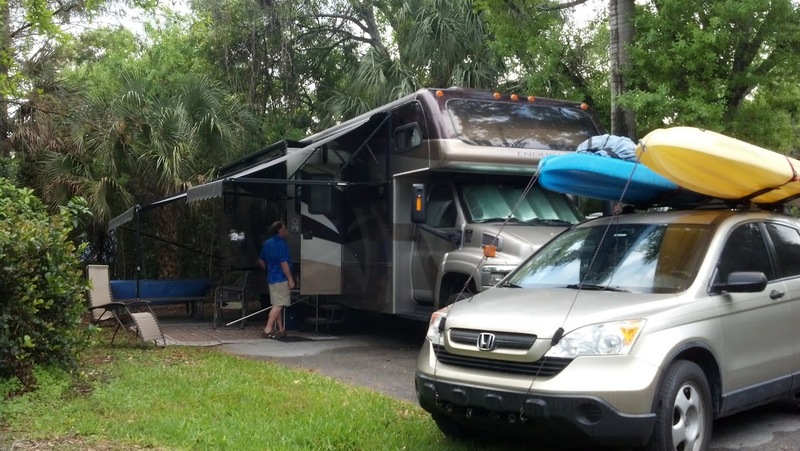 This makes the RVing lifestyle even more fun … if that’s possible! Here’s a map of the current location of all RVillagers who have joined the Geeks on Tour group. Notice that there is a place for a forum and get togethers. Also notice how clicking on one placemark opens up the details of that placemark and shows you who it is. You can bet that, as we travel, we will pay attention to this map and find out who is nearby, consider staying in the same park as them, and scheduling get-togethers. Geeks on Tour Members warm our hearts! Meanwhile, back at Thousand Trails, we saw a message in our RVillage account from Bill and Kris inviting us for dinner. How cool is that? 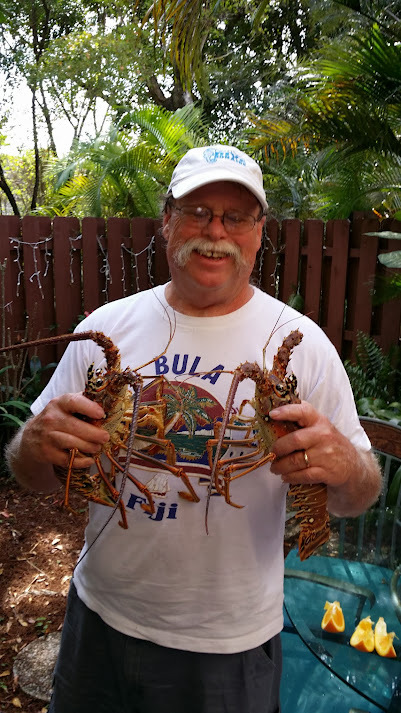 Bill Osborne has been a premium member of our Geeks on Tour learning website for several years. He is our poster boy for what you can do when you learn from Geeks on Tour. Notice the quote by Bill that we used in our print ad in the Gypsy Journal. We gladly accepted their dinner invitation, had a wonderful meal, and got our puppy fix playing with their dog Winston. But, best of all he filled our hearts by telling us of all the ways he is enjoying the RVing lifestyle because of things he learned from Geeks on Tour! We taught him how to Blog, and he now spends a lot of time recording their travels and getting creative with his writing, photos, and videos. 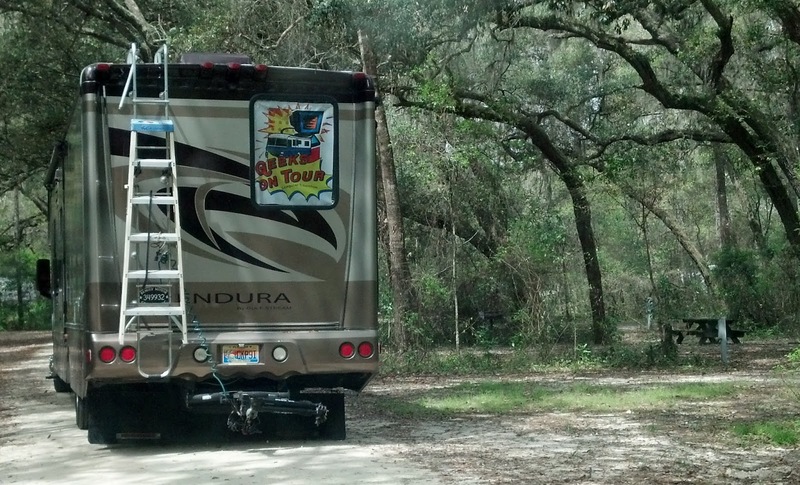 This hobby has become a large part of his RVing experience. But, don’t take my word for it – read his own words in his blog! Seeing The USA: Geeks on Tour. Kris is pretty good on the computer too, she tells us she learned how to use Streets and Trips by following our videos. But she prefers knitting and crocheting as her hobbies on the road. I was admiring her knitted wine glass covers so she gave me a set! Cool! I love ‘em. Bill and Kris will be joining a couple other RVers and making a trip to Alaska. You can be sure we will follow their journey on their blog: www.SeeingTheUSA.com. And, we can easily see exactly where they are by viewing their map on RVillage. One of our goals in staying at the Thousand Trails Orlando park was to get some more use out of our Disney pass that we bought in the fall. 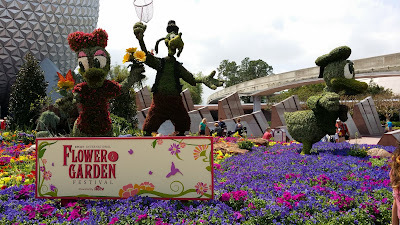 We heard that the Flower and Garden Festival was on so I figured there would be some good photo ops. This next picture was taken with Jim’s new Galaxy Note3 phone. What a cool feature! Picture in Picture. It uses both the front and the rear cameras on the phone at the same time! After visiting a few attractions at Epcot and getting our fill of delicious food at the International food stands around the World Showcase, we decided to take advantage of the park-hopping feature of our passes and head over to Animal Kingdom for the rest of the day. We really enjoy the Safari ride there. I had my camera on the action setting for these shots and snapped 3 or 4 of each animal. Later, in looking at all the pictures that had been auto-backed up to my Google+ account, I saw that the “Auto-Awesome” feature had taken some of those animal sequences and turned them into animated .gifs! How funny. We ended the day with the roller coaster ride called Everest Expedition. I’m not much of a roller coaster fan, but this one is fun. More pictures on our March photo album. 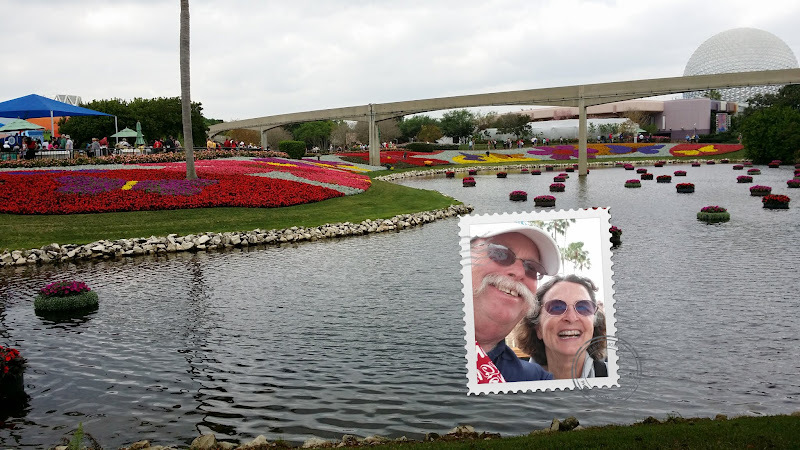 We thought we'd hang around the rally fairgrounds for at least one day as we recuperated and wound down from a very busy week, but it was not to be. The electricity was turned off around 10am - a sure sign that we were being asked to leave! We turned on the generator so we could take care of the necessary things, but slowly got ready to hit the road and head back south. Our next 'gig' is at a computer club in Sarasota, Florida. It is apparently still winter and Florida is the place we want to be! So, we headed south, not knowing where we would get to the first night. I studied the Allstays App for a spot somewhere around the Gainesville area and Ginnie Springs jumped out at me. 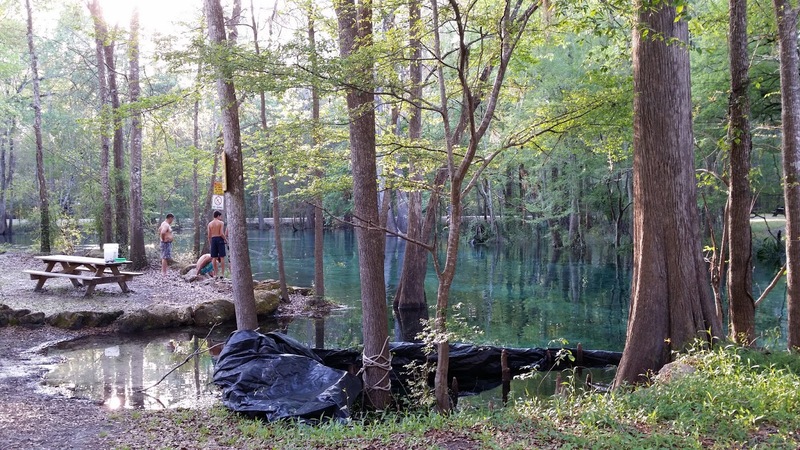 Jim and I have been scuba diving in those gin-clear springs and knew it to be a very special forested campground as well. We've never been able to stay with the RV before because they don't allow pets. We've been sadly pet-less for about a year now ... there are a few advantages. Now this is what most people have in mind when they say "campground." Such a pretty place, and the birds have the most beautiful voices! Jim got right to work setting up a homey camp, with a table cloth on the picnic table, the awnings out and the grill ready to receive dinner fixin's. I sat down at the computer and was very disappointed. Our Verizon phones which normally provide Internet to our computers would bounce back and forth between one bar of 3 or 4G and a 1X signal, or simply NO signal at all. I tried our iPad with it's AT&T service and found the same lack of connection. I got out our Wilson "Sleek" 3G booster and it didn't help either. We walked up to the office where there was supposed to be Wi-Fi and had not much more luck there. OMG ... what do we do?? It is a beautiful place for a bike ride! Lots of people were swimming and scuba diving in the springs, but we thought it was still a bit nippy for that. I finished one book (Coast to Coast with a Cat and a Ghost) and started another (Going Home with a Cat and a Ghost) that I had already downloaded to my phone's Kindle App. I did the download while we were on the road, just in case we were going somewhere with no Internet. I really like reading on my Droid phone - it's so easy to hold in one hand, it lights up to read in bed and I can even turn the page using just one hand. It was actually quite a delightful, peaceful 2-night stay. But, after 2 nights, we really MUST have Internet! So, it's off to Orlando and the Thousand Trails park there. Good Internet, great hot tub, near Disney World where we have season passes, and best of all it's FREE. Well, "Free" isn't quite the right word ... pre-paid maybe describes it better. We have a membership in Thousand Trails and we pay roughly $500/year maintenance - then when we pull into a park to stay for a while, we don't pay any more. It's home! It started out rainy and cold ... I mean really cold. I think I saw the temperature show below 40 one morning! Watch an Aerial Video of the fairgrounds where about 3,000 RVs were parked for this rally. The first morning we had to be up and at our table at 7am! That's when registration started for all rally sessions that required pre-registration and a fee. 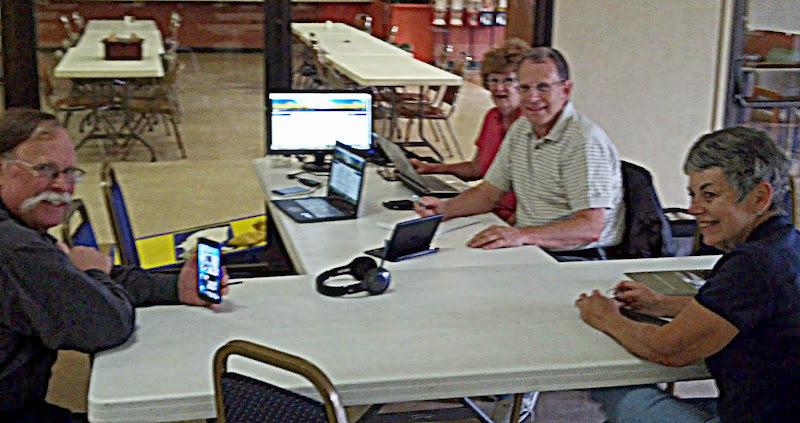 We had 2 sessions: Hands on iPhone/iPad class, and Hands-on Android phone/tablet class. Then, we had to gather our wits and be prepared to present 3 seminars back to back for the rest of the day. Here's the schedule of our offerings at the rally. The next morning we woke up to even colder and rainier weather, if that's possible. Our first seminar was after lunch, so all three of us: Jim, Devon and me, hung out at our table for the morning. We had lots of people who had attended our sessions the day before, come by to sign up for membership, or ask us questions. Then we went off to teach Movie Maker. That went really well. I think the people that attended that one will go back to their computers and create true works of art! Then we had the first of the hands-on sessions. iPhone and iPad Tips for Travelers. We had about 16 people in that one and we paired them up and made them buddy up and do things like take pictures of each other and email them. Then take a video and watch it. We taught them how to turn their phones into hotspots and share the Internet connection with their computers and tablets. And, last but not least, we taught them how to use Google Maps (or Apple maps) - the most indespensible smartphone app for Travelers. We were SOO busy we barely got to catch our breath, let alone visit with all sorts of friends that are here to attend the rally. We did have dinner with our good friends Phil and Tracey of TechnoRV the night before everything started. 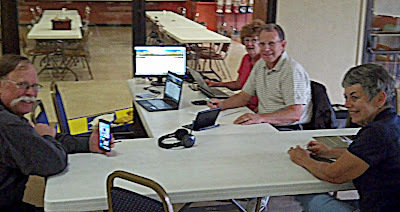 And, we got in a little get-together made possible by the new social network for RVers called RVillage.com. Other than that, it was all work, work, work. We were so glad to have Devon here with us - while we were presenting seminars, he could be at the table for people who wanted to sign up for membership. All totaled, we welcomed 78 new or renewing members to Geeks on Tour! I did snap a few pictures, and here they are in a collage - prepared in Picasa, of course! Now to rest for a few days ... then we'll head back south where it's warm! We'll be spending most of April in Florida. Our last ‘gig’ was on February 21 at Florida Grande RV resort in the middle of the state. 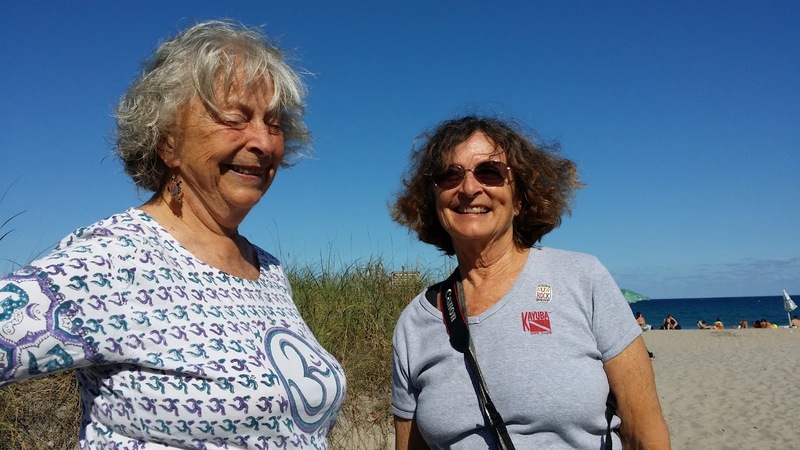 Then we came back to Fort Lauderdale because Jimmy Lyon, Jim’s old-time dive buddy was coming for a visit and they needed to go diving! They chose to go out on traditional boat dives, so I sat it out to stay home and get some more videos done. 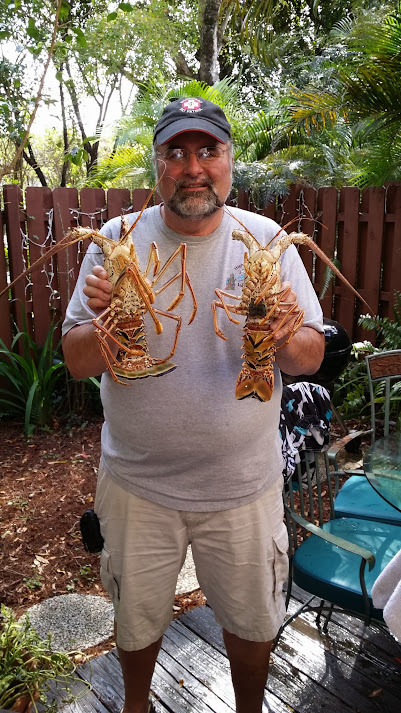 As long as they came home with lobster, I would be happy! First on my agenda was to visit my Mom. 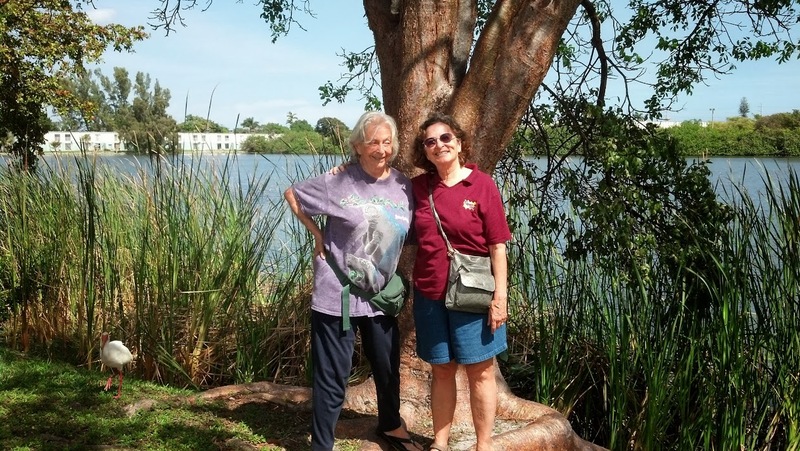 There’s a wonderful little park called Royal Palm within a mile of her assisted living facility and I like picking her up and taking her there for a walk. 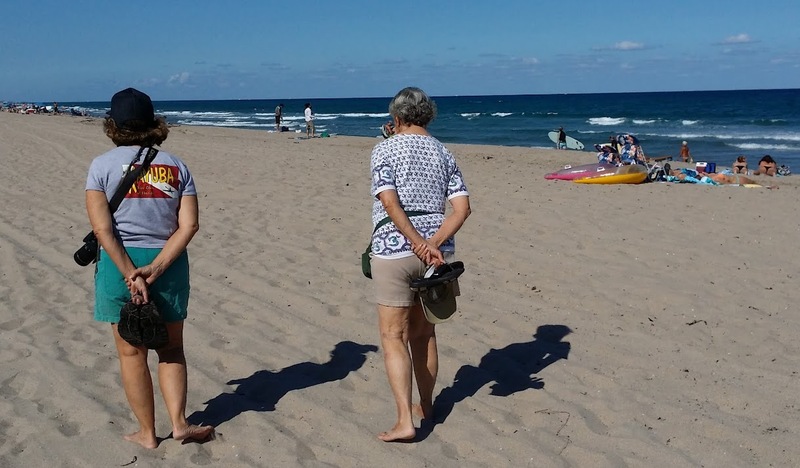 Then, another day, both Jim and I picked her up and took her to the beach up in Boca. Sometimes I think my Mom and I are twins instead of mother/daughter. Look at the pictures below and I’ll bet you agree?! I sure hope that doesn’t mean I have the same future of Alzheimer’s in store for me. But, just in case … I’m cramming in all the living I can do now … and trying to make enough money to save for assisted living too! 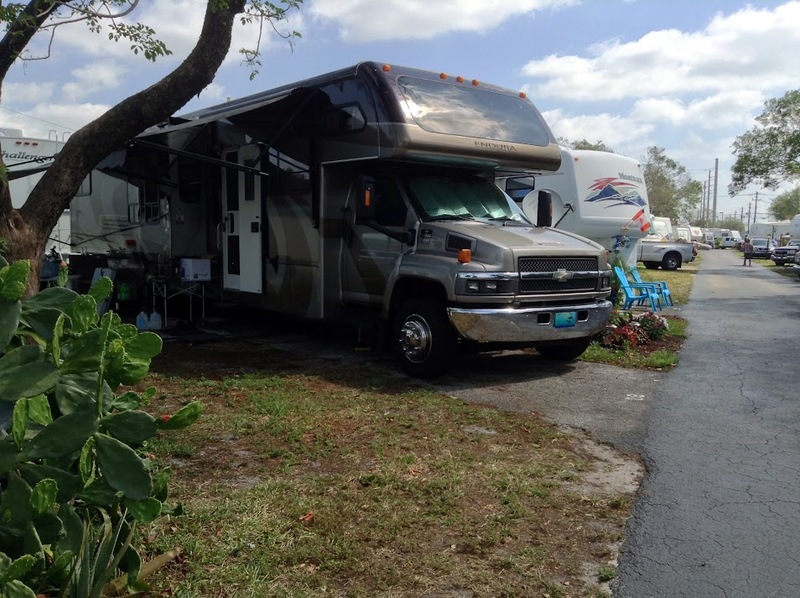 February and March in Fort Lauderdale is an impossible time to find an RV site. People book sites a year in advance for those dates and, of course, we had no reservations at all. Our home park of Paradise Island can usually find an overflow site for us, but even that wasn’t available, so we had to spend a few nights in a local parking lot. Then we were able to get a couple nights at our favorite park of Easterlin County park. After that, we had to go back to the parking lot, then one night at Paradise, then 3 nights at Easterlin but at 2 different sites. 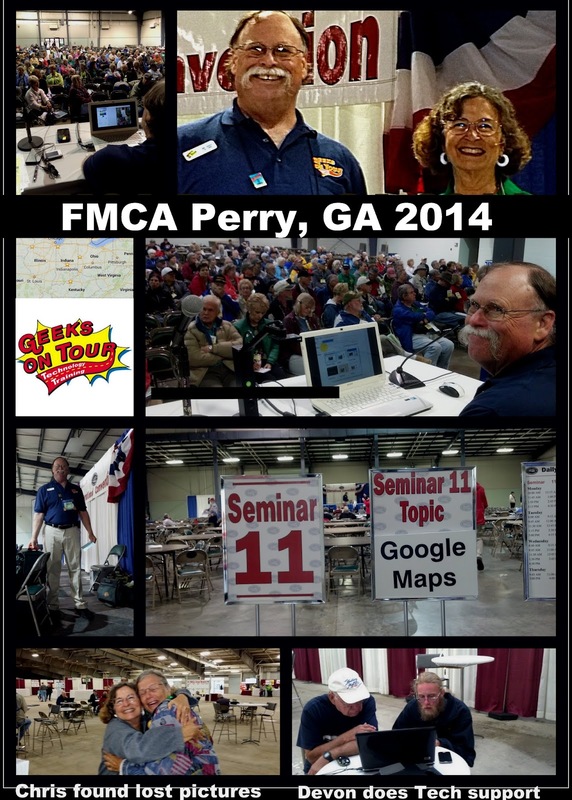 Then, finally we got a site at Paradise for the 8 days left before leaving for the FMCA convention in Perry, GA. The parking lot would have been cheaper, but we had lots of work to do to get prepared for the FMCA rally, we like full hookups! Easterlin County Park is truly lovely! Except for the traffic noise, you would have no idea you are in the middle of Fort Lauderdale. Here’s our site now at Paradise Island RV park. 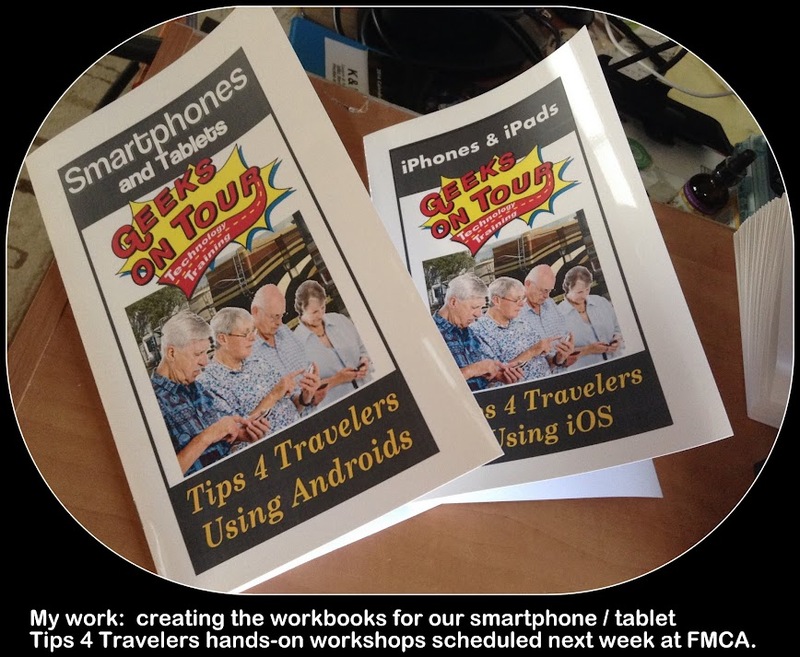 I spent much of my time writing, re-writing, and researching the booklets for our hands-on classes next week at the FMCA RV Rally. As well as revising handouts for the Escapade in May because they need to be sent in well in advance to give them time for printing. One tough thing about our business, you simply cannot rest – as soon as you print some instructions, they’re out of date. Rarely do we use a set of handouts more than once. If you’re going to the FMCA convention in Perry, GA next week be sure to stop at our table in the Info center and say Hi! Here's the complete program for the FMCA RV Rally next week. Once you open it, you can use the search tool to find everywhere that Geeks on Tour are scheduled! 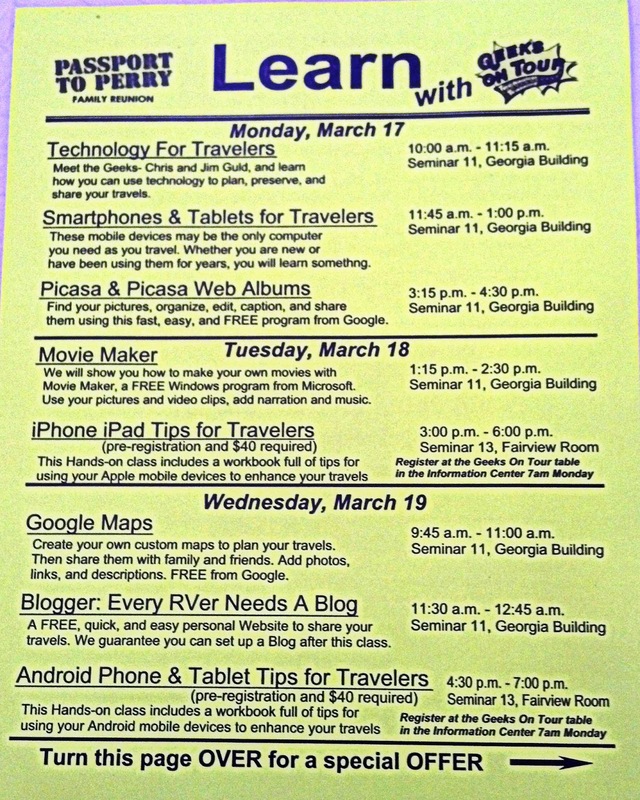 We'll be giving 6 regular seminars and 2 hands-on workshops for smartphones and tablets. The seminars are included with admission - all you need to do is show up. The workshops require pre-registration and a $40 fee. We'll start registering people at 7am on Monday from our table in the Info Center.